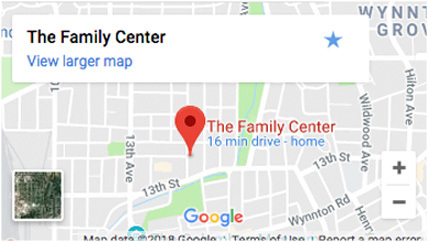 Originally established in 1909, The Family Center was founded by a group of concerned business leaders and community volunteers as a social welfare and family rehabilitation organization. In the beginning, the organization operated as the Welfare Bureau for Muscogee County residents. In 1936, when the State of Georgia formed what is now known as the Department of Family & Children Services and began providing direct assistance, the organization channeled its energies into other areas of social work and became the first accredited behavioral and mental health counseling center in Columbus, Georgia. Over 100 years later, The Family Center continues to address the needs of the communities within our region, with an emphasis on empowering those who are vulnerable, oppressed, or living in poverty. As needs have changed in the community, The Family Center has responded and adapted to those needs. Today we continue to serve nearly 10,000 individuals and families each year, with a variety of programs designed to deal with the current problems of today. The Family Center is a charter member of the United Way of the Chattahoochee Valley. In 1984, The Family Center started a youth mentoring program and became affiliated with Big Brothers Big Sisters of America, the nation’s leading mentoring organization. Through this program, we provide mentors for at-risk children ages 6 – 14 empowering them to achieve their fullest potential. In 1986, The Family Center became affiliated with the National Foundation for Credit Counseling, and began assisting individuals and families in the areas of money management, credit, debt repayment, and homeownership. The Family Center partnered with the IRS in 2004 and became a Volunteer Income Tax Assistance (VITA) center, providing low-income families with free tax assistance and e-filing of tax returns. This service allows families to receive the maximum refund available and advice on the best possible use of their refunds by helping them establish a savings plan or pay off debt. The U. S. Dept. of Justice, as part of the Project Safe Neighborhoods, anti-gang prevention efforts, named The Family Center a recipient of a grant in 2007 to establish a Families and Schools Together (FAST) program in partnership with the Muscogee County School District (MCSD). Due to outstanding success of the pilot project, this program is now in its 5th year of operation and serves children and families in four elementary schools, Dawson, Georgetown, Fox, and Rigdon Road. The Dept of Health & Human Services, as part of an initiative to reduce recidivism among youth of incarcerated parents, named The Family Center’s Big Brothers Big Sisters program a grant recipient in 2008. This program matches children who have a parent who is incarcerated with an adult mentor, specifically trained to deal with issues involving truancy, gangs, drugs, and other deviant behaviors in order to stop the cycle of incarceration.